Akili Amina, is a poet/writer who has maintained ayear long blog featuring her poems and journaling her thoughts. Eight of Akili's poems have been published in five literary magazines. Four of her poems have been published in two anthologies. One of the anthologies is on the inauguration of President Obama and the other is calling for change concerning the homeless. 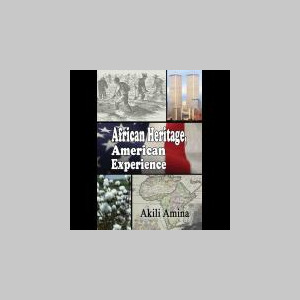 She has written a poetic memoir of her life and the history of the African American peoples in her book, "African Heritage, American Experience". We invite you to take a look inside of this wonderful book.